According to researchers, sharks are only dangerous when you're injured or "mistaken" for food. I've also heard that the Tiger shark is one of the few animals which actually consider a healthy human as prey and will stalk and hunt you down, then eat you completely. Is this true and, if so, are there other animals that behave this way? Firstly, allow me to put the danger posed by sharks in perspective. World-wide, of the countless hundreds of millions of people who work and play in the sea each year, only 70 to 100 are bitten by sharks and only 10 or so are killed. In contrast, many thousands drown each and every year. The sea itself is *far* more dangerous than any shark. That said, it is NOT true that sharks are only dangerous when one is injured or mistaken for food. In fact, the vast majority (something on the order of 96%) of shark 'attacks' are single strikes — often either a bump with the snout or a raking with the upper jaw teeth only, with no biting or removal of tissue. This fact *strongly* suggests that most shark attacks have little — if anything — to do with feeding. It is my suspicion that the two main motivations of shark attacks are: 1) self-defense and, 2) investigation. Let's look at each of these in turn. Like any wild animal, sharks will defend themselves if threatened. Despite their reputation for ferocity, sharks are actually remarkably non-violent creatures. If a shark 'feels' threatened — due to being pursued, grabbed, speared, or otherwise molested — it will most likely either swim away or attempt to signal its unease by way of a specific display, a kind of 'body language'. My own field research has revealed that the exact character of shark displays elicited in conflict situations varies from species to species, but there are some features common to all species studied to date. Among the most obvious of these is a pronounced lowering of the pectoral fins, the paired, wing-like fins located behind the gill slits. If this warning is ignored, the shark may swim away rapidly or launch a lightning fast, slashing attack. Since we are the visitors in the sharks' living room, the onus is on us to be a well-behaved guest, to recognize their signals, and to respond appropriately. Like any opportunistic predator accustomed to feeding on broad spectrum of prey types, sharks must be perennially ready to investigate new potential food sources. despite their reputation for stupidity, sharks have remarkably large, complex brains, complex and subtle social behaviors, a well-developed sense of curiosity, and exhibit a rudimentary ability to reason. Without benefit of hands, sharks investigate novel objects in their environment with their mouths. Many sharks can control their jaws with astonishing dexterity, and their teeth and gums are highly sensitive. There are many well-documented reports of sharks gently mouthing objects in the sea. Given that shark jaws are incredibly powerful and their teeth extremely sharp, it is clear that sharks are capable of inflicting much more serious wounds on humans than they usually do. It is my suspicion that to most sharks, a human being is a large, unfamiliar, and altogether frightening creature. But some of the larger species, such as the Great White (Carcharodon carcharias) have learned that they have little to fear in their liquid realm and may be willing to take a gentle test nip. In many cases, the victim is released after a single contact and suffers only minor wounds. It seems more likely that such 'attacks' are motivated by curiosity rather than predation. 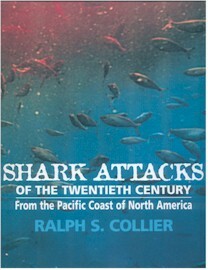 Human beings are NOT a regular part of the diet of any species of shark, and very, very few people have ever been consumed by their attacker. (Feeding on human corpses is another matter, of course — any carnivore will scavenge when the opportunity arises, and we are not exempt from this practice). Not even the fearsome Great White Shark — large individuals of which regularly catch and consume marine mammals — shows any particular interest in killing or eating a human being. After all, if a swift, 2,000-kilogram (4,400-pound) Great White with razor-sharp, serrated teeth wanted to eat a human, there is very probably *nothing* that a comparatively slow-swimming, 100-kilogram (220-pound), unarmed primate could do to prevent it. So the real question isn't 'Why do sharks sometimes attack humans?'. The question is: why don't they do it far more often?